swedishcharts.com - Nicki Minaj feat. 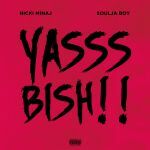 Soulja Boy - Yasss Bish!! Ouais euh, ça reste quand même bien pourri. Oh look, Soulja Boy is still making music. Well, if you'd like to even call this music in the first place.<br><br>Soulja Boy is really just pointless in this song, and Minaj is annoying as per usual, complete with her stretching out of words and high-pitched singing.<br><br>Avoid.